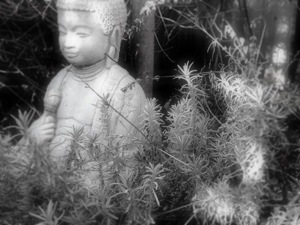 Lavender branches surrounded the sweet Buddha statue in a small corner of the garden. Leaves had fallen, of course, and the weather was kind of grey, and damp, as it so often is, here, on the shores of Lake Ontario, this time of year. It was, most definitely, still autumn. And, my garden transformed into a winter wonderland. 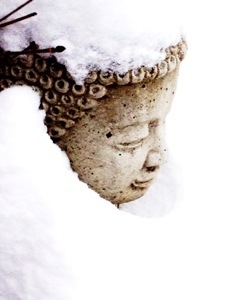 And, the beautiful statue now wears a cloak of the finest snow Mother Nature can provide. The peace of the garden remains, but the season of it has truly changed. Hoping, that wherever you may be for the holidays, you are having a wonderful, peaceful, joyful time.